Across from the Parthenon, Erechtheion has gained acclaim for its south porch, which is supported by female figures in place of traditional columns. These six figures, called caryatids, play the same architectural role as columns and were built from marble. The caryatids are exact replicas of the originals, which are on display in a protected environment in the Acropolis Museum. The temple was built between 420 and 406 BCE, and the complex was designed to protect its several sacred shrines. Using our world travel planner, Athens attractions like Erechtheion can form part of a personalized travel itinerary. The temple built in honor of Poseidon and Athena. Ancient art of construction underline especially the caryatids (supports in the shape of women). Situated on the Acropolis, so even if you did not want, and did see. According to me the most beautiful preserved building on the Hill. This is the One of the things I visited Athens for. 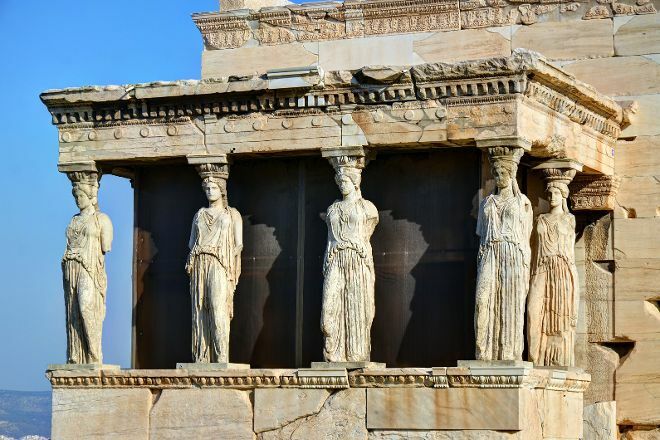 These 6 women figures look so dramatic on the top of the Acropolis hill, ancient and proud. Even the Parthenon I don't find as attractive as the Erechtheion, even tho' the original statues are displayed in the nearby museum. So happy that I've seen it with my own eyes! One of my favourite Greek temples with the outstanding Porch of the Caryatids - although these are copies of the original ones (one can be seen at the British museum, and the other five at the acropolis museum) due to its choppy history. The temple was built at different heights and tried to preserve several shrines, but it is widely believed to be dedicated to Athena.